I promise to use it only to send you Promo&News. Thought it couldn't get better? Ever wonder why you can get food in bulk to save money, but nothing else? Quality is important when it comes to educational toys, but the costs can really add up quickly, don't they? On the one hand, you don't want to sacrifice the quality in your children's toys and yet, on the other hand, you need to watch your budget. Why is it that no one could solve this effectively? Perhaps it's because an effective program was never properly coordinated. But imagine if you can get the high quality educational toys that you want for your children at a fraction of the cost. Imagine being able to get them for 10% to 40% off of regular retail price. Spending less for the same thing. Or getting more for your money. It's up to you how you want to see it. But bottom line, you are getting better value for your money. For the first time, as far as we know, we are trying to coordinate our customers to purchase products from a manufacturer as a group. In doing so, they will offer us a discount and we'll pass that discount onto you. The end result is a lot more money left in your pocket at the end of the day. Since we are focusing on a manufacturer instead of one item, you can now choose from a wider selection from the chosen manufacturer. You don't have to worry about adding to other people's efforts on a particular product. Just choose the products that you like and everything will be added together. Because they are all from one manufacturer, all items help to drive the cost down. They like it better when we buy bigger. From the customer suggestions, we didn't have enough demand for the Schleich Castle, so this time, we won't be offering the Schleich line. But we are keeping the castle in the list since it was part of the initial offering and a few people were interested in it. The overwhelming majority of responses were for the Thomas & Friends set. 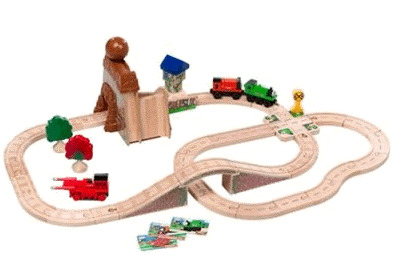 So this time, we're offering the extended line of Thomas & Friends items for Group Purchase. Simply check the boxes in the form located at the bottom of the page with your product selections. And please make sure to pass the word to family and friends because every bit helps to lower the price even more. P.S. To ensure the absolute highest level of accuracy, we'll be contacting you prior to sending in the final order. In the meanwhile, if you have any questions or worries, don't hesitate to get in touch with us by using the Contact Us form.